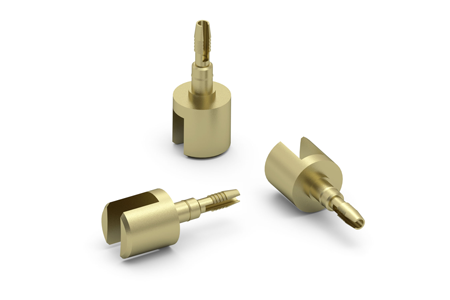 Mill-Max introduces a new terminal pin suitable for use in a variety of board-to-board and wire-to-board applications. It features a compliant press-fit tail, slotted head and an additional press-fit feature on the barrel of the pin. These characteristics combine to provide functional, versatile and reliable connection options. The new 3622-0-32-15-00-00-03-0 pin is designed to be a versatile solution for some popular interconnect configurations. The pins can be used individually or they can be packaged in customer specified connector arrangements. 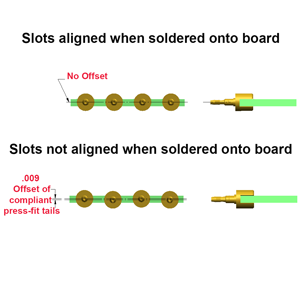 The solderless press-fit tail allows the pins to be staked into printed circuit board holes and then have soldering operations performed on the slotted end of the pin without compromising the connection to the board. The compliant press-fit tail is designed to work with standard .040" +/- .003" plated-through-holes and will provide a gas tight connection. The 3622 can be used as an edge board mount pin by fitting the board into the slotted end of the pin; this facilitates right angle board-to-board mating such as daughter card to mother board. When used for board edge connections the printed circuit board is slipped into the slot and soldered; this may be done before or after the compliant tails are pressed into the adjoining board. The slot will accept board thicknesses up to .062". Please note, due to the unique manufacturing process and size of the 3622 the slot has an arc shape. 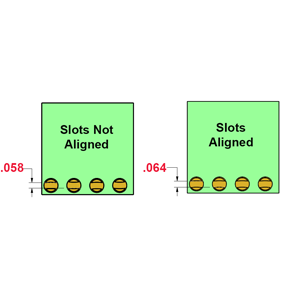 For certain applications where multiple 3622 pins are used in-line, the slots must be oriented correctly otherwise an undesirable offset can result. For instance, in the example shown above, in order to prevent reducing the effective width of the slotted openings of the 3622 or a misalignment with the holes intended for the press-fit tail, the slots must be uniformly aligned. See the figures below illustrating these conditions. The 3622 can also be used for wire-to-board applications where a permanent termination of wires, for power or signal transmission, is required. 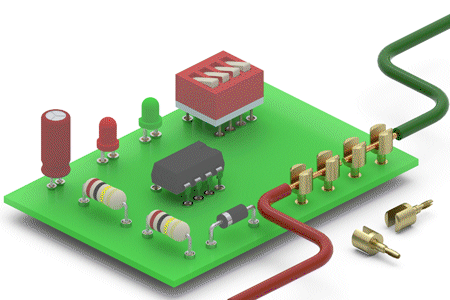 Once the pin is pressed into the board, the wire can be placed into the slot and soldered. 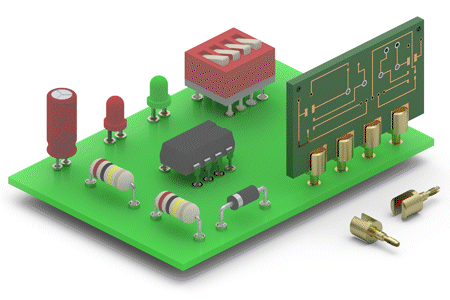 Since there is no soldering operation required to make the secure electrical connection to the board, there is no concern about compromising this connection during the soldering of wires. The slot will accept up to # 16 AWG stranded wire. The 3622 slotted, compliant tail terminal is a versatile, robust and convenient solution for board-to-board and wire-to-board interconnect applications. Like all Mill-Max pins, the 3622 is precision-machined to the highest quality and consistency. It is available with standard 10 µ" gold plating (thicker gold plating available upon request).